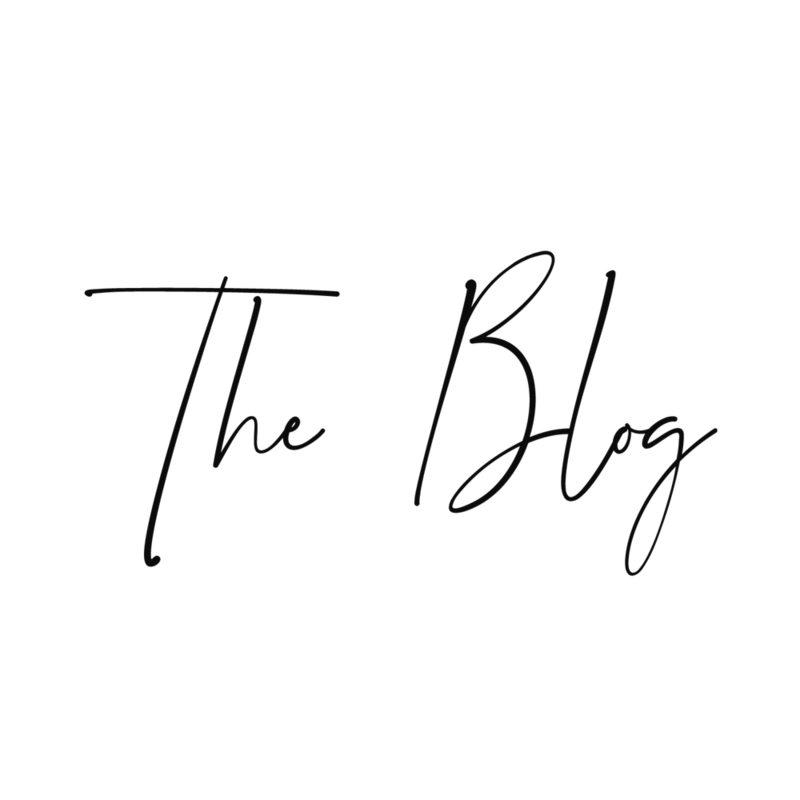 Blog — danielle & co. This post contains affiliate links, which means I make a small commission if you purchase an item using one. Thank you for supporting danielle & co.! If you're a painter, I bet you have the same problem as me - wanting allllll the paint colors. In the past, I've used pan paints because it is so much bang for the buck. For instance, I love the set by Kuretake that costs only $37 for 36 colors (available on Amazon)! I've used it for years, and the colors are lovely and mix well. It's also so quick to just close the lid and slide it back on the shelf when you're done. Recently, I've tried a few tube paints and I've just fallen hard for Winsor & Newton professional watercolor paints. The colors are so vibrant and the pigments so smooth! The issue? They are not so easy to store away when not in use. (FYI, if you scroll most of the way down, I share links to what paint tubes I currently have). I spent some time researching the best ways to store watercolor tubes, and considered purchasing a variety of plastic organizer that were just... bleh. A few resources recommended storing tubes of paint cap-down, in order to cause less separation in the ingredients and help them last longer. Inspiration struck! 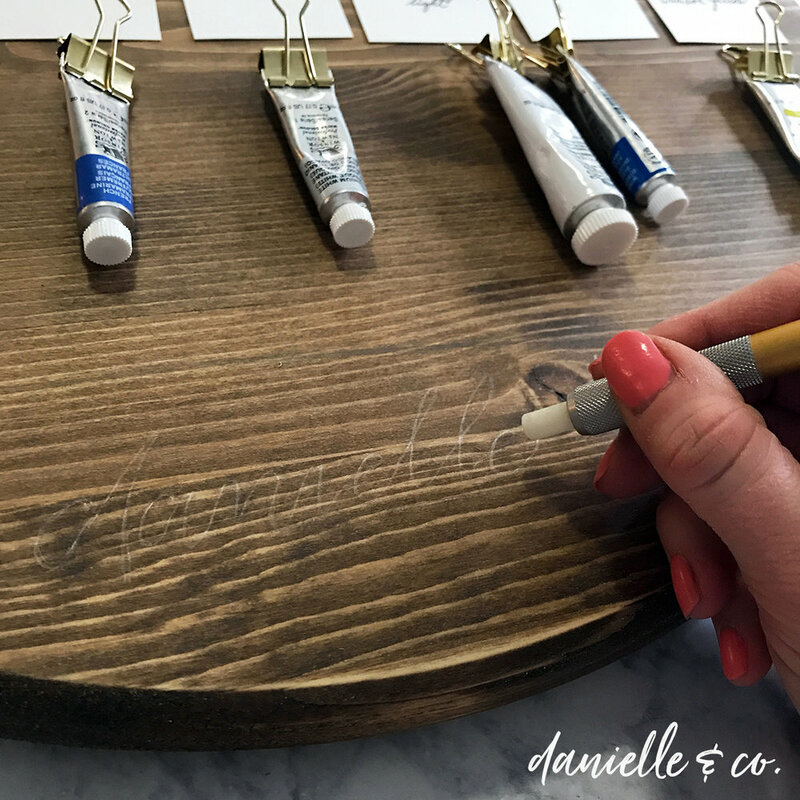 So, today I'm sharing with you how to build your own DIY watercolor tube paint storage board - and for $32 or less, in one day! I decided to go ahead and build my own tube paint storage board for a few reasons. I loved using vertical storage space, and can hang this right above the rest of my supplies. Also, my studio is just a little corner of my living room so all my supplies are on display - aesthetics are a priority! After considering various pegboard options and not finding them to be as attractive as I would like, I remembered I had these gold binder clips and decided to pick up a few other supplies and make a custom storage solution that met all of my needs. You may already have some of these around the house! This is a very customizable project, so you can use whatever you have on hand or pick up supplies in the colors, shapes, or sizes you prefer. My total supplies cost around $32 (not including watercolor paints, of course) and I only used a fraction of the stain, finish spray, nails, etc. so could have made two of these easily! 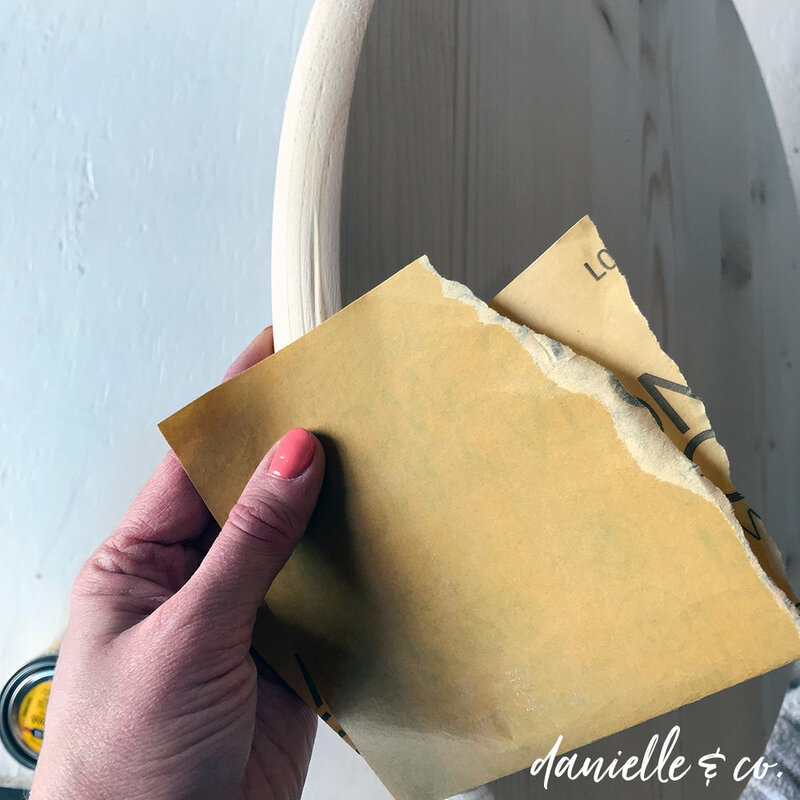 You'll also need a pencil and a hammer from around your house, and something to hang the board on your wall (like Command Strips or a metal hangers you can attach to the back). 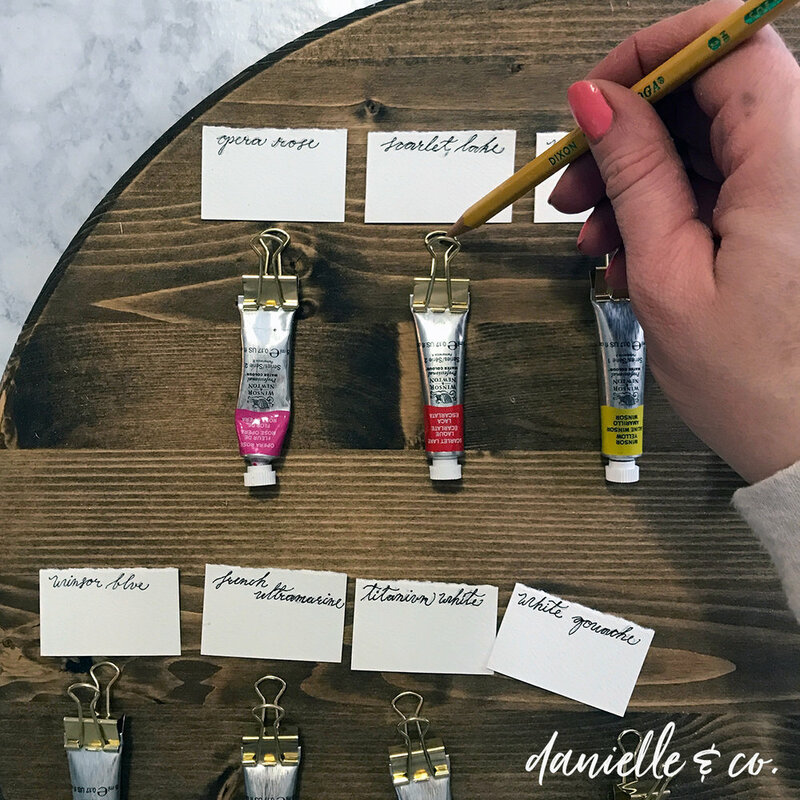 Optional steps listed below include making watercolor swatches to hang above each paint tube, which would also require paper and your painting supplies. Also, I used a white Sharpie paint pen to write my business name on the board, just for fun - if you have a little extra room on yours, it is a fun way to personalize it! 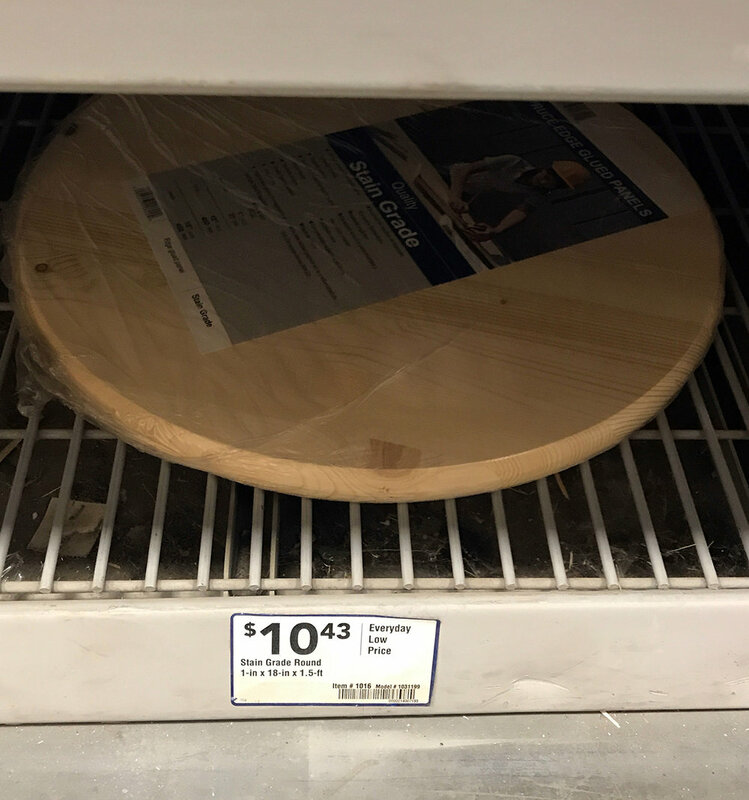 BTW, I just chose a round board for fun; a rectangular one would fit more paints! 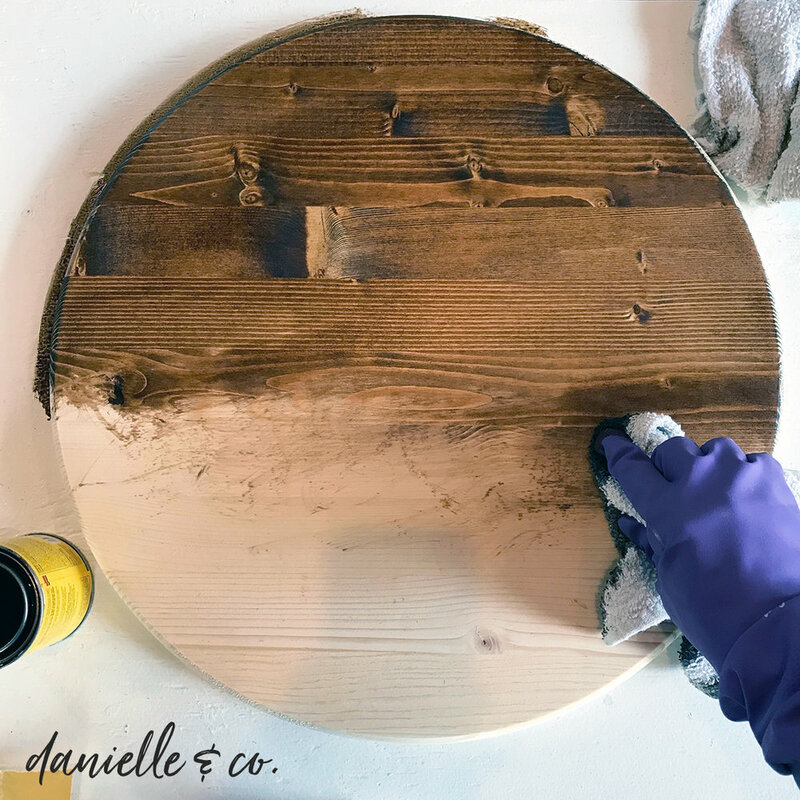 While the stain-grade wood board I picked up from Lowes Home Improvement is advertised as stain grade and already sanded, I found some of the edges a little rough and used a spare piece of 220 grit sandpaper to smooth them down; this is optional if your board doesn't need it! Next, I did one coat of pre-stain wood conditioner by Minwax. I highly recommend this step, even though it is an easy one to skip. 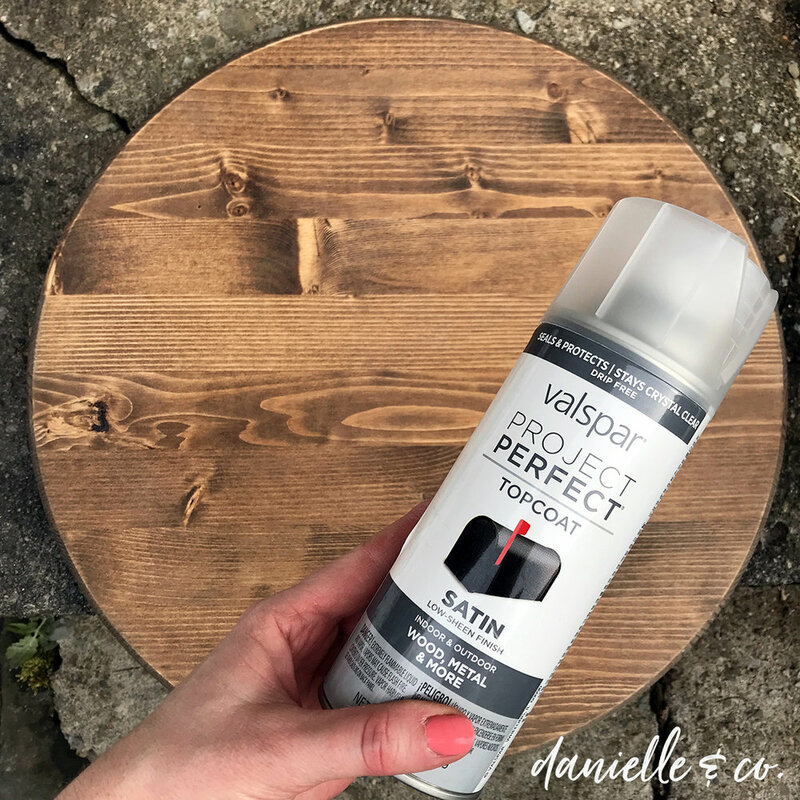 In my experience, the overall quality of a wood stain project ends up so much higher when you use this stuff, and it only takes spreading on a thin layer, a quick wipe-down with a rag and then 30 minutes of dry-time. Just trust me on this one! Allow at least 8 hours to dry. After the board had thoroughly dried, I brought it inside and laid out everything on top of it to see what layout I liked. 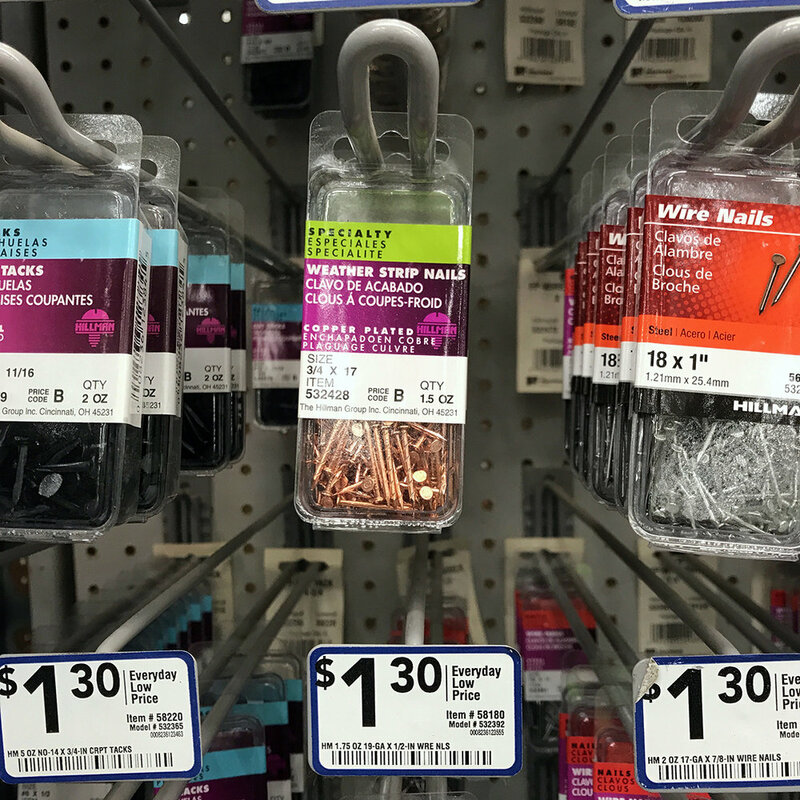 I began by putting the binder clips on the paint tubes, and laying them in rows with the paper swatches above them, to see how many would fit in each room. Then, I used a pencil to mark the hole in the binder clip handle, so I would know where to put my nails. Wondering why I left so much space between them? Most of my tube paints are the smallest size available (5ml). However, if in the future I pick them up in the 14ml or 37ml sizes, I want to be sure they still fit on the board. I measured the larger tubes and they were about 4" long, so I went ahead and left enough space for that. 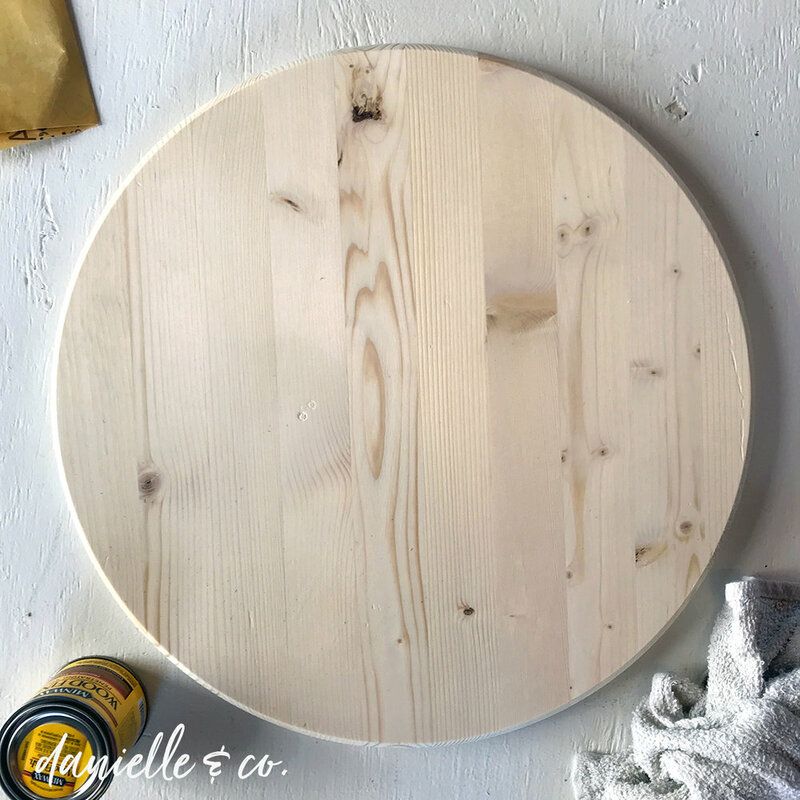 You might also want to make a bigger board, if you have more paints! Tube paints are a little pricier than the pans I've used in the past (like $6-$10 for just one tube) so I'm limiting myself to a smaller initial palette. In reality, I can achieve all of the same colors I used to get from pan paints, just by mixing the pigments together. I do hope over time to collect more colors, so might have to make myself a bigger board in the future! The next step is simple - just go ahead and hammer in a nail on each of the spots you marked with your pencil! 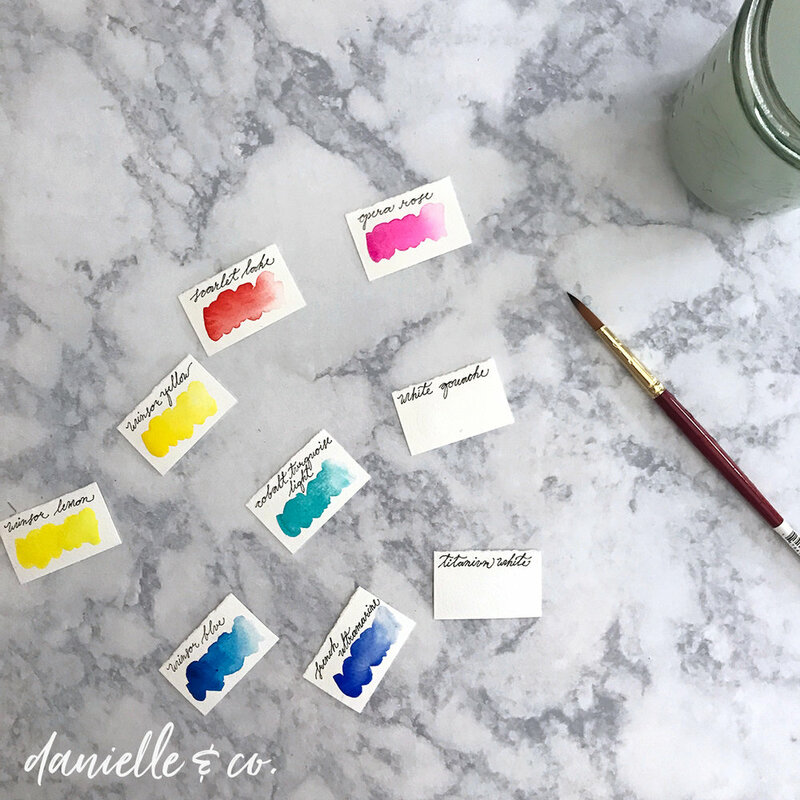 Paint a pretty little swatch on each piece of paper! Tip: I found Winsor & Newton's guide to a "6 Colour Mixing System" really helpful as I chose my starter tubes! I have plans for a larger board in the future, and am considering using a larger rectangular board, one with unfinished bark edges, or a lighter stain color. There are also so many fun binder clip colors and designs available! You can see I still have a few empty clips, so room to grow! If you're looking for an attractive yet affordable storage option for your tube paints, I hope this does the trick! 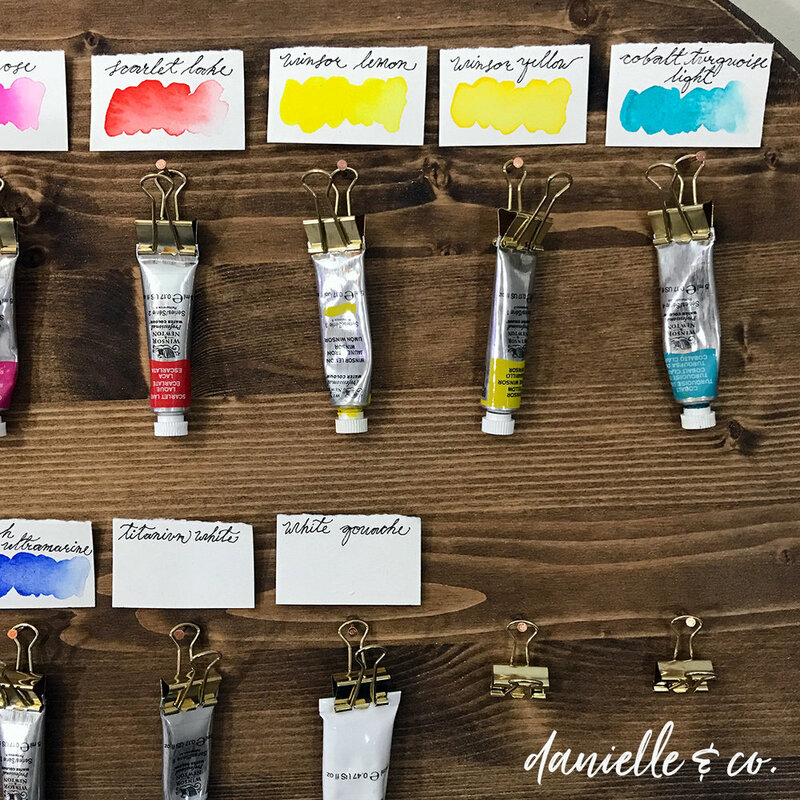 How do you store your watercolor paints? 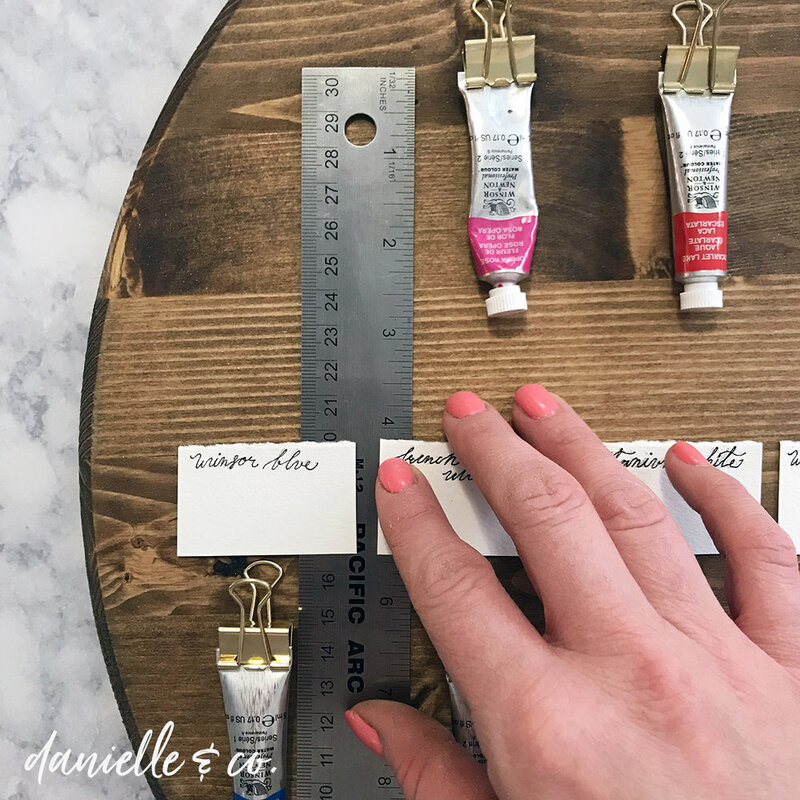 Do you have a large collection of paints, or just a few that you mix together? How to Make Double-Sided DIY Backdrops! If you are (like me) still in the process of building your business, you know what it feels like to run out of something. Time, money, help from others... resources are limited, and you have to make tough choices every day about what you invest in. Do you spend the two hours you have free scheduling social media, or developing your craft? If you have a little extra money, what do you spend it on when there are so many things you still need to do? Last month, I shared the first of a four-art blog series where I asked established artists & designers to share advice for those of us just starting out. Today is the second part, and it's a good one! Today, we're going to talk about what's the best investment to make when you are a beginning artist or entrepreneur. Below, you will find the sage advice of Stephanie Fehrenbach, Ingrid Sanchez (a.k.a Creative Ingrid), Ashley Rayne (a.k.a The Wild Hippies), Jessica Roux, and Monica Lee-Henell. You can check out their advice below, with a little description of each artist and links to their websites and Instagram. Let's get to it! "What is one investment you recommend a beginning artist and entrepreneur make in their business?" 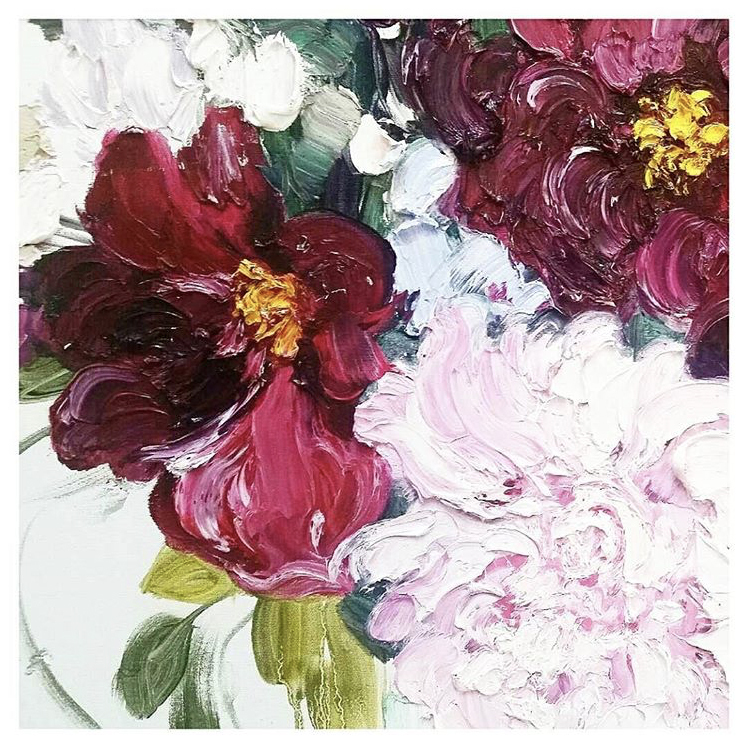 Stephanie is an Ontario based artist who works with oils, watercolors, and other mediums and who I've always especially admired for her floral paintings; they are just so vibrant and full of movement! Invest in your website for sure! Your website is a reflection of you and your art, so make it the best you can. You don’t need anything really fancy, just a clean layout that’s simple, easy to navigate and lets the art shine. I use Squarespace and I love it! You don’t need to hire a designer - the templates are beautiful and super easy to use for a non-techy person like me! Ingrid (or CreativeIngrid as you might recognize her) is a Mexican artist based in London, who creates a prolific amount of work that is so bold & vibrant. The process videos of her painting large florals & abstracts are so captivating, I always look forward to them! Seriously, the best investment is time. A lot of people ask me about the brand of my watercolours or the size of my brushes. That is not important, but practice is. Because I say a lot, “practice, practice”, people think I don’t want to share the “secret”, but this is the secret. It’s not free, practice requires time, a lot of it. It’s a huge investment because no one is paying you and sometimes it can feel like a waste of time, that is why patience has to be present. 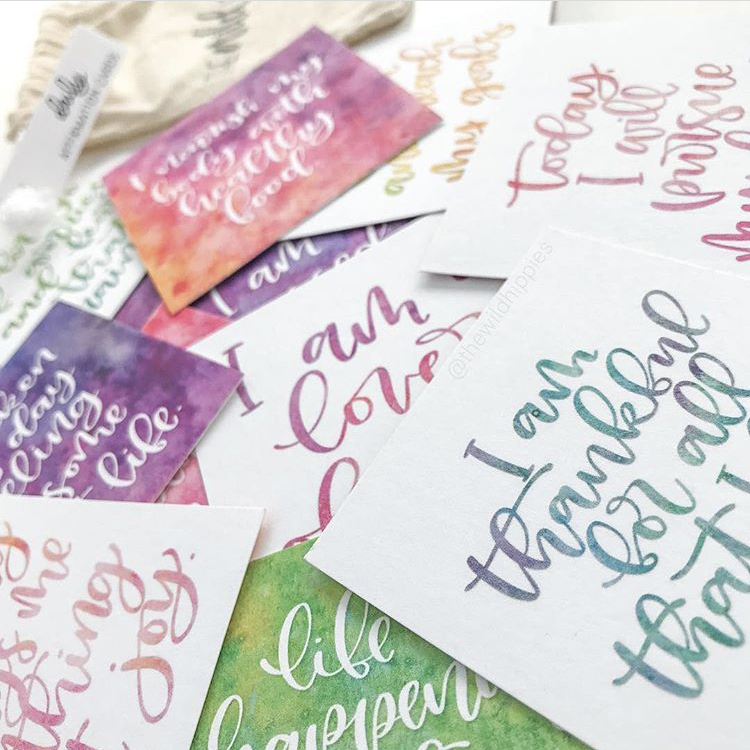 Ashley (better known as The Wild Hippies) is a hand-lettering artist who is all about the positive vibes! Her colorful, cheerful artwork is shared on Instagram & available on Etsy. Her sense of humor is what sets her apart from other artists online, for me! Jessica's work is subtle and lovely in a way that's hard to describe without having seen it first. With very consistent use of colors and technique, she focuses on nature in a unique way. What draws me in is how she illustrates animals with so much life and detail. Monica's work feels ever-evolving, but always in a beautiful direction. I've followed along with Monica's work for years, and her vibrant, moody abstract and floral paintings always make me stop scrolling in Instagram just to admire them for a moment. The answers from each of these artists are different, and at first may seem contradictory. What I take away is the importance of picking something to focus on and invest in. As opposed to picking alllllll the things to invest in, and feeling overwhelmed and scattered. When you have limited resources, it's better to do 1-3 things really well than 4-15 things mediocre. This is advice I'm taking with me into 2018! I spent 2017 trying out a lot of new things and experimenting. While I think full video tutorials are awesome and fun to make, I realized they doesn't play on my strengths and took a lot of time away from painting and blog writing. Those are the very things most crucial to my work! So, I'm letting the idea of weekly video tutorials go. Instead, I'm going to focus on quality blog content and building my online shop. This also keeps me from rushing out and getting expensive video equipment, and helps me to use what I already have. Stephanie recommended using Squarespace as an affordable way to have an amazing-looking website without the cost of a designer. I absolutely agree; Squarespace is what I use too, and it is so clean and intuitive, I can't recommend it enough. What's one investment you are making in your business? How have you narrowed down your focus, to be sure you're directing your resources where they are needed? Please share in the comments below! 100+ Hashtags for Painters & Calligraphers, Sorted by Category! Putting your artwork and photographs out into the online world can be exciting and scary. You worked so hard to create those images, and want to be sure to get them in front of other artists, brands, and potential buyers - but you might wonder, what if something bad happens to them? While fear shouldn't ever stand in the way of you successfully building your business online, there are ways to protect your images so they aren't used by others in ways you aren't okay with. To be fair, images aren't always stolen by a super shady person. For instance, someone writing a blog post about motherhood might want a great image of a mother and a baby playing with blocks together. So, they google "mother and baby playing with blocks", then click on google images and see a great, high-quality photo that is exactly what they were looking for! So, they just right-click, choose "save image" and add it right into their own blog post graphic, with their title and blog name right on top of it. Ugh! Didn't they even care that someone else worked really hard to create that great photo, and isn't getting any credit? Honestly, it may have not even crossed their mind - some people think if an image is right there on Google, it must be okay to use, or that it's unlikely they would get caught. There are ways to protect your images using both technical and strategic moves, so let's dive into 5 simple things you can do today, to protect your images before you upload that Etsy listing photo or awesome Instagram post! A little clear communication can go a long way! It seems obvious but people often forget about simply stating your expectations. You can add a brief statement on your website or alongside your images, letting viewers know what you're comfortable with in terms of sharing your work. For instance, if you have a portfolio or gallery page you can add a sentence at the top stating how much you hope the viewer enjoys your work, to let you know if they have any questions, and to please not share your images without your written permission. There is also the matter of commercial use vs. personal use. If you're selling your work online, you want to be really clear about this in your listing language. Let's say you're selling a digital download of a repeating pattern you created. First, you'll need to decide exactly what you're selling - and it's not just the PDF file. Is the buyer purchasing the rights to use this image only for personal use (such as to print out and hang on a wall in their home), or limited commercial use (such as a header image on their website) or for commercial use (such as printing the image on throw pillows and then selling them, without your name anywhere on that pillow). You are purchasing a digital file that you download and print out yourself. No physical item is shipped. You cannot alter/resell/share, or claim it as your own. You can use this artwork for personal use only. You cannot use it for commercial purposes. Since this listing is delivered via instant download, no refund can be issued. All sales are final. You don't technically need to provide a written copyright notice with your work. When you create an image or artwork, it automatically is copyrighted to it's creator. However, it's a great reminder to others and helps clearly communicate your intentions about use of your work. It's a quick, simple thing to add if you haven't already - mine is right in the footer of my website, and at the bottom of every sales listing I create. You may also want to consider adding a free DMCA button to your website. You can find more information on the DMCA website, but essentially they provide free assistance in the form of buttons and "take-down notices" to help you protect your work online. I've never had to utilize their services, but I've heard they are a great resource! This is an important one! You don't need to watermark every single image you put on the internet (for instance, I've never watermarked an Instagram post - that would feel weird), but anytime you are uploading a full-size, clear image of your work you need to make sure you get a watermark on it first. A watermark is simply a semitransparent layer of text or image that you save on top of your image, that would make it difficult for anyone to save and use it. It is a great deterrent, and something you can easily do while you're already editing your images - it only adds about 30 seconds of work, once you have a method down! Above, I used a simple text layer to add my website name on top of the images. 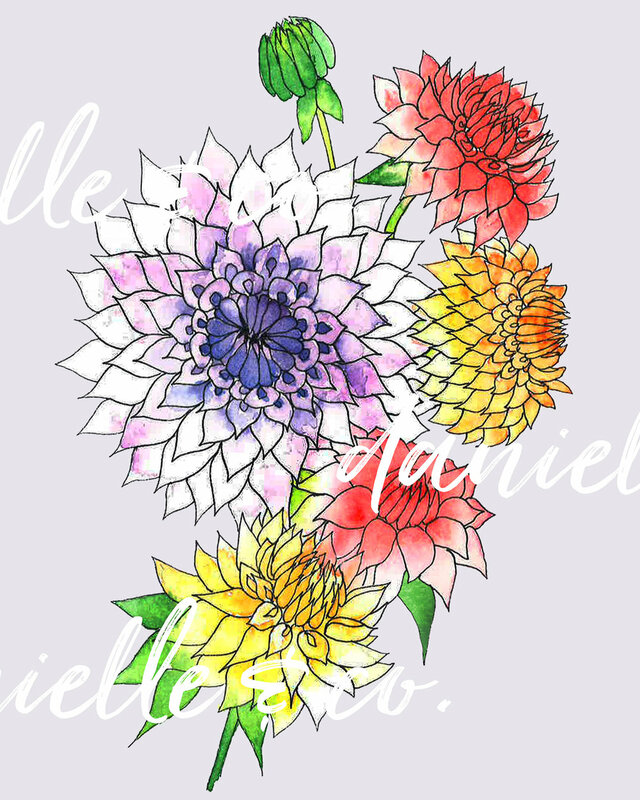 My goal is to watermark it enough to make it difficult to save and edit the image without permission, but not so intrusive that a potential buyer can't view the details. For a brief tutorial of two ways I add watermarks to images in Photoshop CC (but can be done in all sorts of photo editing software!) check out my YouTube video below. Consider subscribing to my YouTube channel to stay caught up on future videos, too! If you use Squarespace as your web host, you can also watermark text on top of an image right in Squarespace, using the built-in Adobe Creative Cloud Image Editor. The higher-quality and larger the image size, the easier it is for others to print it, enlarge it, and use it in all sorts of ways. 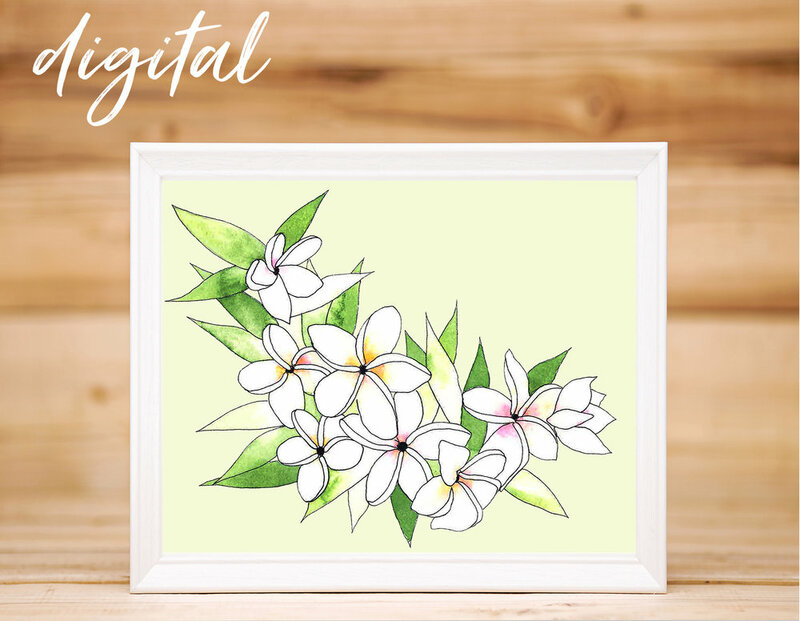 While you need to keep a high-quality version of the image for yourself to order prints of your work or sell it as a download, the images you upload to social media or online shops can be much smaller. A 500kb image that is 1500 pixels wide will still look great as a listing image, on Instagram, etc. but won't be very useful for someone to save and re-use. That is the size Squarespace recommends using for images you upload to the web, and it has always worked for me! If you use the max file size (for many web hosts and online shops that is 20MB), it not only makes it easier for others to steal your images, but might also slow down your website load time. Smaller image sizes is a win-win! If you're looking for a way to reduce the size of your images without sacrificing quality, I've heard great things about JPEGmini. Another strategy that pays off in multiple ways is using styled photos and mock-ups to showcase your work. When your image is used as a part of a larger image, it's going to be challenging for another person to save it and crop out that section, and have it be of a high-enough quality to do anything with. The big bonus is, it also looks great for your viewers! Etsy and other online sellers recommend sharing photos of your products in a variety of ways, including close-ups and mock-ups. It helps potential viewers envision how the work might look framed, above a sofa, as part of a table-scape, etc. You can use props and backgrounds to add a sense of warmth to your work, and make it really stand out! 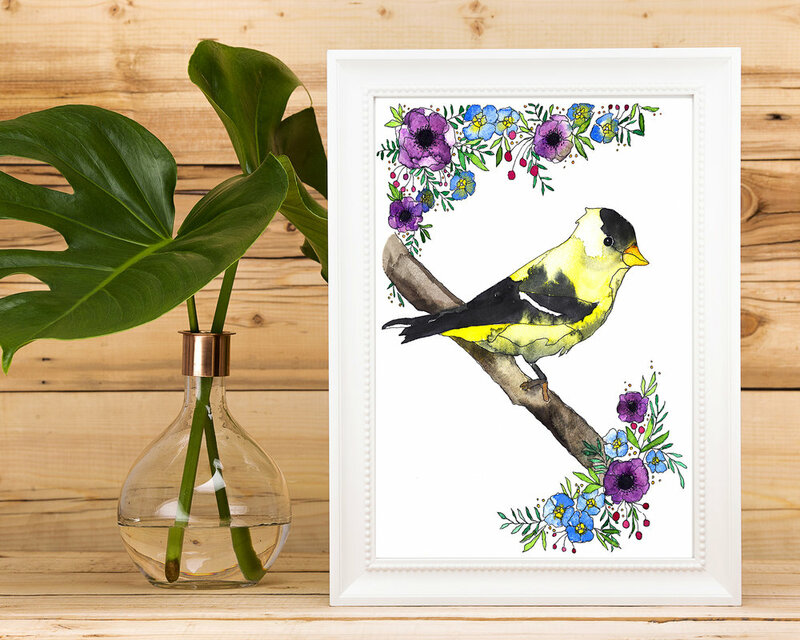 Above, you can see examples of where I have styled images to use on social media, as well as used mock-up frames against wood backgrounds for listing images of my work. 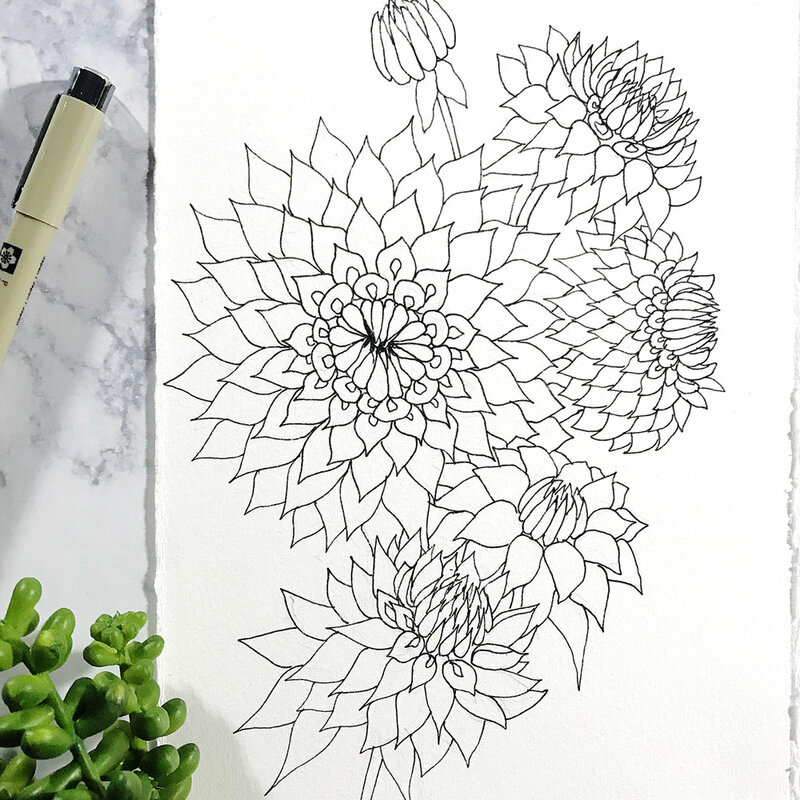 I have a whole blog post on how to style flatlay images of your artwork, so check that out for more ideas! Having others use your image is not always a bad thing! When someone takes an image from your website or social media and uses it without your permission, it can instinctively feel icky. However, there are circumstances where it can actually be beneficial and positive. For instance, a blog using an image of your work in a post such as a "round-up", crediting you, and linking to your website or shop can be awesome! You may not know in advance they are going to do this, and it can be a surprise to stumble on, but if you're being appropriately credited and linked to it can mean your work reaching a whole new audience. It's also super flattering to know your work was appreciated. You might notice that I left out "disable right-clicking" as a strategy, and if you've read other tutorials online you might wonder why. I honestly don't think it is very effective or worth the effort, at this point. Technology has advanced enough that it is so easy for someone to screenshot your image, and anything you do to prevent it can be undone within the viewer's browser. I'd rather spend my time on more effective methods such as adding a watermark. Overall, don't stress too much about it! The more time you spend worrying your images have been stolen, or searching frantically online to see if anyone else is using them, the less time you're spending on producing more amazing work and content. Take a deep breath, take reasonable precautions, and then turn your focus back on what matters. Curious what to do after you discover your image has been taken and used without your permission? Check out this post from the Spruce, which I think is really helpful. Are you utilizing these strategies to protect your images online? Do you have other tips to add? Please chime in, in the comments! Don't miss out! Sign up for the Danielle & Co. Newsletter and stay caught up on blog posts, events, shop updates and best of all - my free weekly content prompt list! Don't worry, I totally respect your privacy & won't share your info with others. Thank you so much for being part of this community, and I look forward to sharing all sorts of awesome things with you! 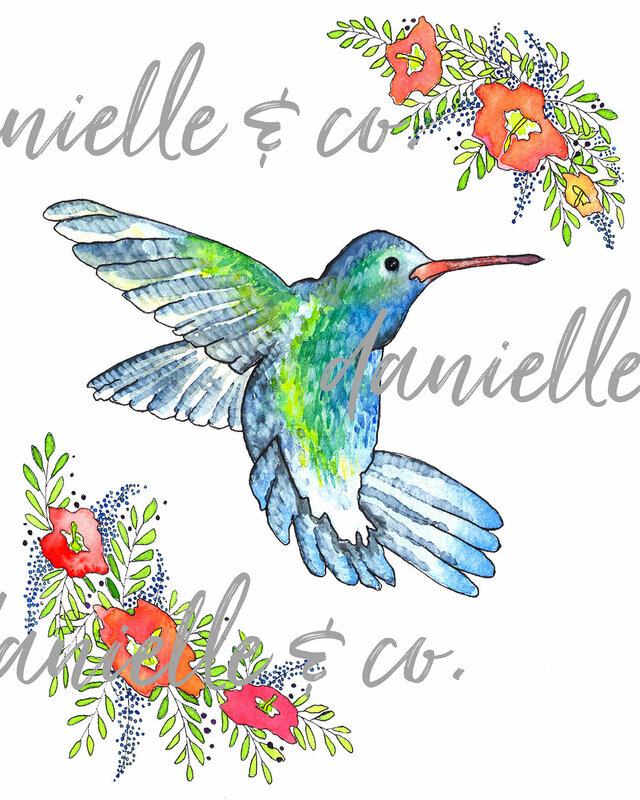 I'm Dani, of Danielle & Co Design. I look forward to getting to know you! If a post is noted as containing affiliate links, it means I earn a small commission should you make a purchase using one of them. If you see something you like, you can shop it and support Danielle & Co. at the same time, and I only recommend things I truly use and enjoy.